COBBLE HILL — Public Advocate Bill de Blasio announced a plan, Monday, to change Brooklyn’s healthcare system as the borough faces the threat of losing community hospitals. The four-part plan calls the city and state to work in collaborating to prevent hospitals from closing in Brooklyn, including in the appointment of a “Brooklyn Health Authority,” who would manage “the future of healthcare in Brooklyn,” said de Blasio, at a press conference in front of LICH. The plan would use federal money to assist Brooklyn hospitals like Long Island College Hospital, Interfaith Medical Center, Brookdale University Hospital and Wyckoff Medical Center. The entity, who would be appointed by the mayor and governor, would “coordinate spending of health dollars, drive down costs by helping Brooklyn’s small hospitals negotiate as a collective, and push for higher care standards,” according to a press release. “We see right now our city and our state government fiddling while Rome burns,” said de Blasio. The second point of the plan would prevent hospitals from falling into bankruptcy, which often leaves them with no option but to shutter, de Blasio said. A “Healthcare Transformation and Construction Fund” would focus on the development of new clinics, ambulatory care and hospital construction. The final point would “implement higher standards of care” in Brooklyn hospitals, particularly in the treatment of chronic diseases and to prevent “Hospital Acquired Infections” that were found to be “significantly higher” than the state average in two-thirds of Brooklyn hospitals, according to the state Department of Health, the press release stated. Thirteen-year-old Cobble Hill local Mollie Gordon has been rushed to LICH on several occasions because of a syndrome that causes fainting spells, said her mother, Sharon Gordon. “My husband would just pick her up and run down here,” said Gordon, who stood in support of LICH with Mollie on Monday. 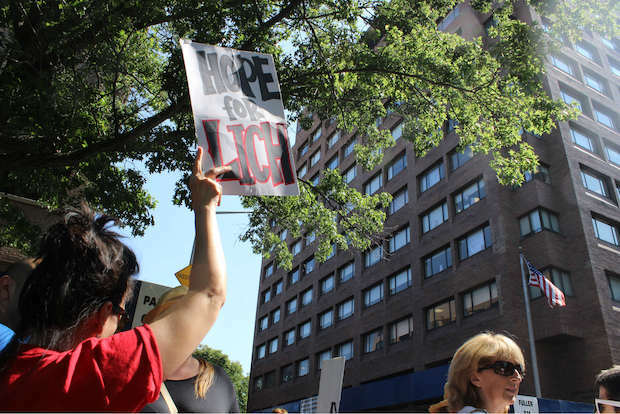 While LICH advocates cheered de Blasio’s healthcare plan, Dr. Alice Garner, head of neonatal intensive unit at the hospital, voiced concern that the plan may not help LICH in the immediate future, she said. The hospital is currently running because of a court order to maintain its service levels.